This is NOT an article about weightlifting squat technique, how to “squat properly” or how “knee cannot go past toes”. My movement interests are totally elsewhere! 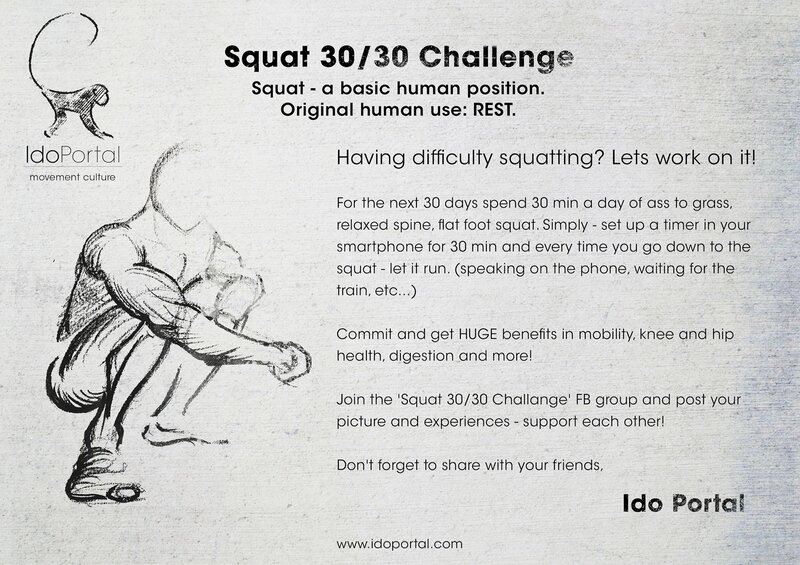 I believe (deep) squat is one of the fundamentals of human movement abilities. Not just for resting, but actually for doing everyday things. However because we live in modern world and everything around is made to make our lives easier and more comfortable, we lost a lot of things that are natural for us. First you need to realize that it’s not a one time trip. To maintain something you need to use it daily. Make it part of your life, not just part of your “workout routine”. If you don’t see yourself using it daily don’t even start that journey, because for you’ll lose it again for sure. I started to work on mine squat about 2 years ago. From not being able to squat at all, until now, when I can comfortably squat for few minutes at the time and use it for daily activities. There are few common problems I struggled myself with. This is usually because of poor ankles dorsiflexion. To fix this use on the beginning something under your heels, maybe rolled yoga mat, books, whatever works for you. And with the time, decrease the height until you eventually end-up with flat feet on the floor. It takes time, long time, don’t rush! All these are definitely enough for everybody to start with squat. There is no exact prescription or plan. You can start with one routine a day, slowly increasing to 2-3 times a day. Remember that you need to start slowly, especially if you’re coming with no squat at all. Don’t push yourself to the point of pain, you’ll only hurt yourself. I know it from my own experience. To get back squat you need to re-structure your whole body and that takes time. It will not happen overnight, neither in a month or two! The most important thing!? You need to be persistent and patient. Let me know if you struggle with your squat and need a help!